Shands Road Sawmills Ltd was founded in 1964 by Colin McCorkindale and Harold McCrystal at 35-39 Shands Rd, Hornby, Christchurch. A small sawmill was built on a 5,000m2 site previously used for growing strawberries. Initially 5 staff produced standard fencing and construction grades but within a few years the focus changed to supplying the rapidly expanding local manufacturing sector with pallets and the horticultural and agricultural industries with bins. In 1969 Colin McCorkindale purchased Harold McCrystal's shares and later his sons, John and Bryan joined the company; John in 1971 and Bryan in 1973. Colin retired as Managing Director in 1978 and John and Bryan purchased the shares. In 1983 a higher capacity sawmill was established on a new 22,000m2 site at Calgary Pl, Hornby. Over the next 15 years further reprocessing capacity was installed including kiln drying and cable drum manufacturing facilities. In 1998 a cable drum manufacturing branch was established in new Plymouth and pallet and bin manufacturing plants were established in Temuka and Dunedin. 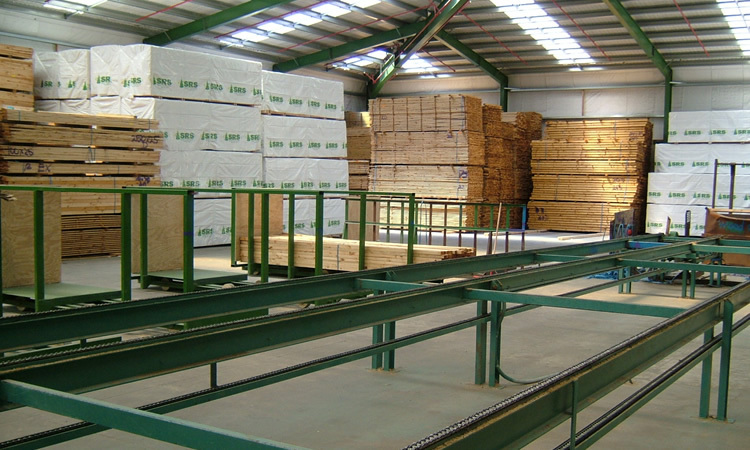 In 1999 a new 80,000m2 site at Jones Road Rolleston was purchased and a high capacity, fully automated sawmill and kiln drying plant was commissioned in 2001. In 2003 the Hornby site was sold and all reprocessing facilities were moved to a new 4,000m2 building on the Rolleston site. At this time the company name was changed to SRS New Zealand Ltd.
SRS employs over 130 people and supplies pallets, bins and cable drums to many major domestic customers and exports kiln dried timber and CKD products to Australia, China, Fiji, India, Japan, the Middle East, Taiwan, Thailand and Vietnam. All exports are shipped through the Christchurch port of Lyttelton. The sawmill is one of the highest capacity and automated sawmills in New Zealand requiring only two operators and capable of processing a truck and trailer load of logs in less than 15 minutes. We are proud to have built long standing customer relationships, with many spanning over 40 years. Do you sell building or fencing timber? No, but most other sawmills do, and they sell direct to the public. Do you sell standard pallets or bins? There are no standard pallets or bins, we design to suit every customer’s unique and specific needs. Can you custom design pallets or bins? Yes, we provide a full and free design and quote services. One of our team will be happy to visit you to discuss your needs. Click here to contact us. Timber for packaging and furniture is shipped to many Asian countries or assembled into pallets, bins and cable drums for the domestic market.